Archery is an ancient sport that was first made famous by Robin Hood and his Merry Men. These days people only shoot arrows for fun and as a result this activity has become very popular with hen parties. Qualified instructors will show you how to aim powerful recoil bows so that you can hit the target with every shot. The first few may go astray but you should soon have the hang of it and be able to stick a few in the bulls-eye. Archery in Bournemouth can be combined with Quad Biking, Rage Buggies, Clay Pigeon Shooting and Paintballing. 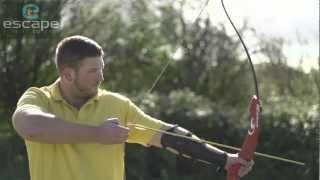 View our Archery £40 video and get an idea of what to expect on this activity.